A while back I was on a trip to the east coast to a church in Rhode Island and saw what looked to me like a great outreach idea. 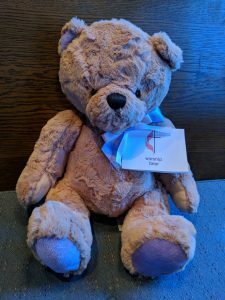 In the center of each pew, someone had placed a “worship bear.” During the service they announced that if you knew of someone who is going through a hard time right now– has a need of comfort, touch, or care—you were free to take one of these bears and give it to that person to let them know they’re thought of and cared for. The bears attend church every week as a reminder that you can take one and give it away. What type of similar outreach gesture might work well in your ministry context? Get creative… there are as many types of outreach as there are people.